Mana Healing CBD’s Serene Mist is a soothing cannabidiol spray that helps in relieving stress, anxiety and PTSD. This fragrant 30 ml mister is an infusion of 15 mg CBD, 3 different mystic gemstones and 3 essential oils and is water based. The directions read: “Shake it well and spray onto face and chest, or spray it on your hands and inhale the fragrance. Keep away from eyes. Keep in a dark and cool place. Do not ingest. 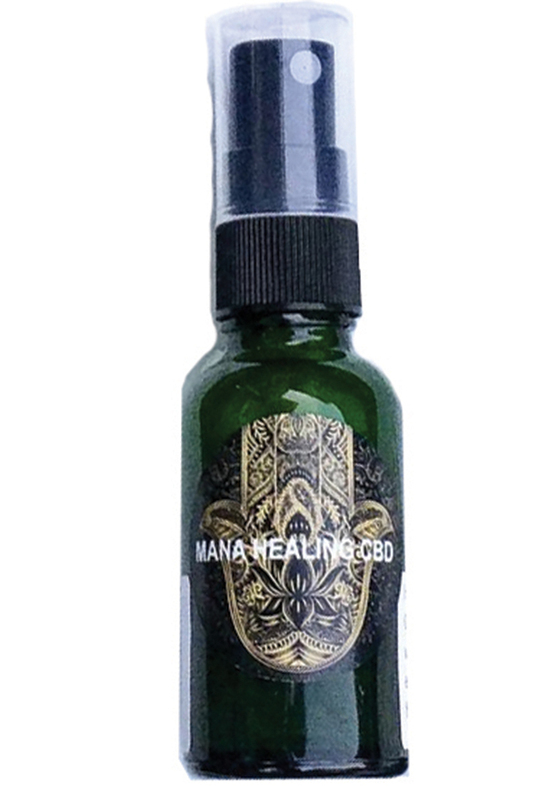 Use our misters within 3 months from opening.” The website also states that everything made by Mana Healing CBD are premium organic & vegan CBD products handcrafted in Hawaii and charged with Divine Healing Energy. The ingredients used are Certified Organic, Fair Trade Certified, Kosher Certified & Non-GMO Project Verified. We got a bottle of this mist while we were in Hawaii at the Maui Cannabis Conference at the beginning of the year. Our booth was next to the Mana Healing booth so we got to know them over the course of the event. This was the Jasmine based spray with healing crystals in it and it felt great. You can smell the herbal undertones of sage and lemongrass that seems to feel sparkly on the skin like dew when it lands. The effects really seemed to soothe, rejuvenate and energize all a the same time. The mist smells wonderful without being too overpowering and it doesn’t linger. This spray can be used to freshen up a room so it’s perfect for travelling and just the right size to take anywhere.